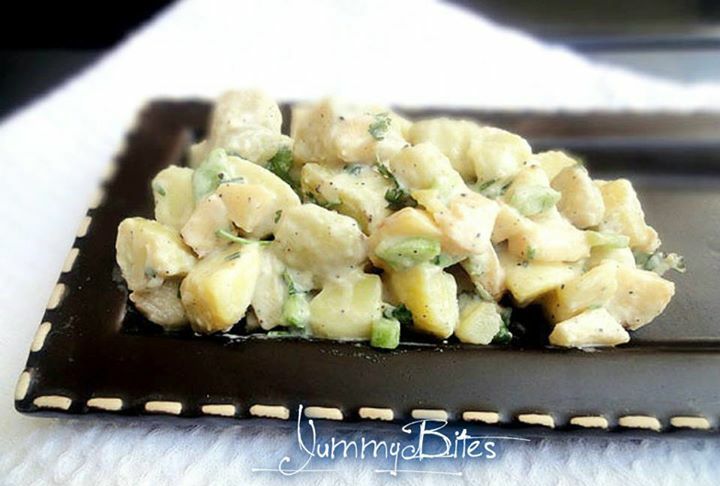 This easy potato salad has great flavor. Goes well with a summer barbeque, or anytime! For a tangy twist, try using plain fat-free yogurt in place of some or all of the sour cream. Garnish with additional sliced hard-boiled eggs, if desired. -Place the potatoes in a large saucepan and cover with plenty of cold water. -Bring to the boil over high heat and cook for 15-20 minutes or until tender. -Drain and set aside for 15 minutes to cool slightly. Cut into cubes. -Take a clean, dry bowl and whisk together mayonnaise, cream and milk. -Add in seasonings along with mustard paste and lemon juice. -Now throw in potatoes along with the rest of the vegetables and give everything a good mix. -For a slightly sweet potato salad, add 1/3 to 1/2 cup sweet pickle relish. -Trim fat grams by using fat-free mayonnaise and just 2 eggs. -Round red and white potatoes are waxy and work best for potato salad because the pieces stay firm when fully cooked. Baking potatoes, which are starchy, tend to break apart and become mushy in salads. -You can prepare this recipe 1 day ahead. Make the mixture expect adding potatoes.Place the sauce in separate bowls, cover with plastic wrap and store in the fridge. Continue the recipe, 1 hour by mixing with potatoes before serving the main.